The earthquake prompted tsunami warnings and advisories for Alaska, British Columbia, the U.S. West Coast, and Hawaii. Residents in low-lying areas along the Gulf of Alaska and in British Columbia were evacuated to shelters and higher ground. The Pacific Tsunami Warning Center later cancelled most of the alerts within four hours of the earthquake, due to the apparent lack of tsunami. The highest recorded waves after the event measured at under 9 inches (230 mm) above tide level on Kodiak Island. Source. 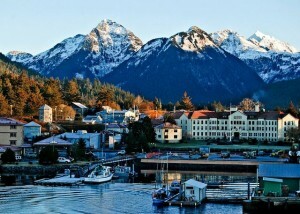 As cell phones were being alerted, the speaker system in the southeastern town of Sitka, Alaska had yet to be activated. Families were already packing up cars and heading to higher ground. Others were on foot heading to higher ground. Bears which would normally be hibernating, were heading to higher ground as well along with deer. Eric was out at Starrgavin park, a popular place for people locally which is several miles away from downtown Sitka. The alert came over Eric’s cell phone. Eric and his girlfriend started back towards town in their car. Having just passed the Alaska Marine highway ferry system terminal, they were going around a bend in the road. Eric’s car died on the spot. They sat for a few moments trying to restart the car. Eric popped the hood to see what was going on with his car. He got out of the car. A deer was running across the road. A moment later a humanoid figure standing approximately 8 feet tall crossed the road directly in front of them. The creature was just a few feet away from their car. I asked Eric what he thought it could possibly be. Was it a bear? Was it a human? What were his thoughts? “That was no bear. I know it definitely wasn’t a human. That was a Kooshtakaa,” he said. His composure changed instantly after mentioning the Kooshtakaa. “His arms seemed a little disproportionate compared to a human. They seemed longer. It just looks different from our arms. His biceps/triceps were definitely bigger than any human I’ve ever seen.” Eric demonstrated how big the arms looked to him. Eric and his girlfriend sat in the car, not knowing what to do next. The sirens for the tsunami alert system started. Time was of the essence to get to higher ground. Eric did not realize until later that his car started quite readily after the Bigfoot sighting. Tsunami alert came and went mostly without incident. I asked Eric to take me to the spot where the sighting had occurred. The subject was changed on the spot. Eric’s girlfriend Diane confirmed what had happened. Diane added a piece of information which Eric had been unaware of. Now with both of them present, I asked if they would show me where this had happened. A few moments of silence occurred. We sat silent as we sipped our tea. They took glances at each other and back at me. Reluctantly, they agreed to take me to the spot. Eric brought out the inner bark of Devil’s Club to chew on. It wasn’t just a sighting, but an experience and one which required us to prepare to go where it happened. We went to the spot where the encounter had happened. Sadly the melting snow wiped out footprints and you could see other animal footprints which were just freshly made. Eric pointed to where the Bigfoot went. You could see the branches, some of which were broken. Eric demonstrated the stride of the Bigfoot. He had to hop to get where he estimated each foot landed as it crossed the road. We got back in the car and drove back to town. The John family welcomed me into their home. I told them that I wanted to learn more about their experience with the bigfoot during the tsunami alert. 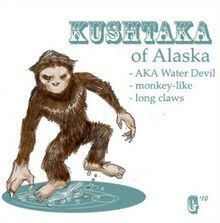 As mentioned in the previous narrative, some Tlingit differentiate between Bigfoot and the Kooshtakaa. As I approached the house, I noted the pieces of Devil’s Club were placed above each door and window of the house. The moment I had mentioned that I was interested in learning about the incident with the Kooshtakaa, their mother left the room. She would not rejoin us for the rest of the interview. It is worth noting here that one can talk about Bigfoot freely to see what terms the witness uses so as to avoid such an occurrence as had happened during this part of the investigation. The sirens were going full blast announcing the possibility of a tsunami heading towards Sitka. The John family’s home was high enough so they decided to stay during the tsunami alert. As they sat listening to the announcement and trying to update everybody on Facebook about being safe, the power went out. Michael noticed that there were lights on the streetlamps not far away so he was going to go outside and see what was going on. Michael told his wife to get some candles. Their children were still asleep. They envied how they could sleep somehow through all of this. Michael opened the front door. What he saw horrified him. Michael picked up a stick and showed me how tall he was. That was perhaps 8 feet tall, maybe 8 1/2 feet tall. Michael said that at the time of the siding, his mother came and looked out the door. He said that she was saying something loudly in Tlingit. I had asked him what she was saying. He didn’t know as he does not speak Tlingit. She was not going to return to fill in this gap due to my misstep earlier. His mother closed the door and sat back down. She didn’t say another word about it. She went back to playing solitaire. The power came back on. Michael cautiously approached the door. “Just leave it,” his mother said to him. Whatever it was, was no longer there. He heard off in the distance what sounded like some rocks being thrown their direction. “I told you to leave it alone. Close the door and sit down,” his mother said. The tsunami alert came and went mostly without incident. Michael and his wife said their goodbyes to me. As I left, I stopped to look again at the shed and contemplated how tall and wide the scripture was as Michael demonstrated it earlier with a stick. The melting snow and resulting puddles did away with a lot of potential footprints. Another Sitka area sighting occurred of a family encountering a Bigfoot during the tsunami alert period. 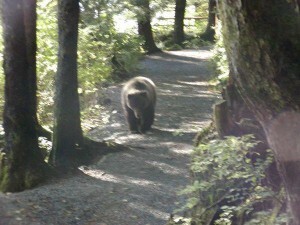 Bears are well-known to local Sitka residents. 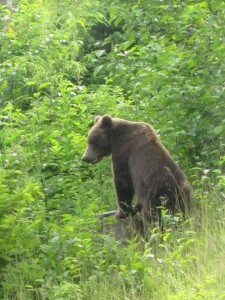 These are summer photographs of Sitka bears. To explain further, here’s some background. Devil’s club or devil’s walking stick (Oplopanax horridus, Araliaceae; syn. Echinopanax horridus, Fatsia horrida) is a large understory shrub endemic to the arboreal rainforests of the pacific northwest, but also disjunct on islands in Lake Superior. It is noted for its large palmate leaves and erect, woody stems covered in noxious and irritating spines. It is also known as Alaskan ginseng and similar names, although it is not a true ginseng…. Traditionally, the charcoal from the stalks is still used to make ceremonial and protective face paints, and among the Ditidaht and neighboring groups, it was equally significant to red ochre as a symbolic link to the spirit world. Native American peoples such as the Tlingit and Haida have used the plant as traditional medicine for ailments such as adult-onset diabetes, as well as rheumatoid arthritis. In vitro studies showed that extracts of Devil’s Club inhibit tuberculosis microbes. Additionally, Devil’s club has been shown to extend life expectancy and reduce leukemia burden in mice engrafted with murine C1498 acute myeloid leukemiacells. 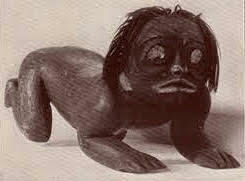 The plant has also been used ceremonially by the Tlingit and Haida people of Southeast Alaska. A piece of Devil’s club hung over a doorway is said to ward off evil. The plant is harvested and used in a variety of ways, including poultices applied externally and ointments, however the consumption of an oral tea is most common in traditional settings. Source. The Alaskan reports contain two examples of the possible electromagnetic interactions with the Bigfoot being seen. While the car not starting and the lights flickering could be (a) coincidences or (b) perhaps due to the earthquake, the EM-effects of the Bigfoot are rare, but documented. In late January 1972, four teenage boys from Balls Ferry, California were on their way to Battle Creek to fish on a dark, rainy night when they parked at the Battle Creek Bridge, they heard a noise, then a scream in the bush. When it turned and ran, so did the witnesses. “I was wondering what it was,” said Darrell Rich, 16, “and at the same time I was turning to get out of there.” James Yeries and Robbie Cross also hightailed it back to the car. But when they got there, they were horrified to discover that the car wouldn’t start. They had to push it before it finally started. A West Virginian named W. C. “Doc” Priestley claimed that a hairy humanoid effected the electrical system of his automobile in October 1960. Priestley was driving through the Monongahela National Forest about three miles north of Marlington, West Virginia, when his car stalled and won’t start. He saw a giant hominoid with all of its long hair standing on end. His friends, driving ahead of him, became worried, and backed up their bus. When this happened, the creature’s hairs dropped and Priestley was able to start his car. There are other EM-effect cases, but those two are classics and oft-repeated. I will gather and share other Sitka sightings as they become available. It should be noted, in 2015, a mother and her 14-year old son went hunting in Sitka, Alaska, and had a Bigfoot encounter. Source.